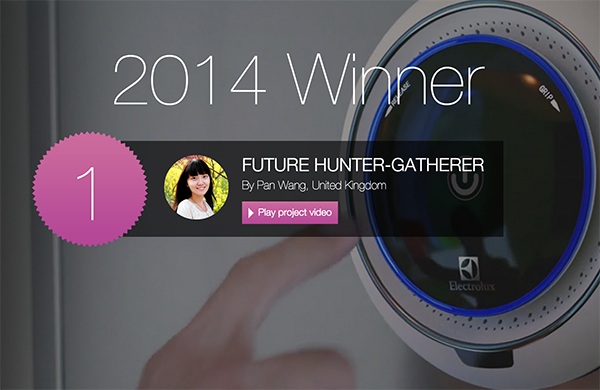 Future Hunter-Gatherer, an educational grocery shopping experience inspired by nature, won the 2014 Electrolux Design Lab competition. The winner was selected by an expert jury in front of an audience of 150 international journalists and bloggers at the Electric Venue in Paris, France. Pan Wang from China, a student from Central Saint Martins- University of the Arts in London, bagged the grand prize of the prestigious Design Lab competition with her design concept, the Future Hunter-Gatherer. The design projects a hologram that lets the user play a game to gather food by fishing, hunting or gathering ingredients from nature. The gathered ingredients are then communicated to and ordered from the local grocery store or market, which in turn delivers the goods to the user’s doorstep. In line with the theme Creating Healthy Homes, the design creatively proposed solutions to healthier and more pleasant living environments for future generations. “In an educational, honest and playful way, this concept addresses issues of ecology and consumer awareness related to the food supply chain in an urban society,” said Lars Erikson, Senior Vice President Design at Electrolux and Head of Jury. Placing second and third respectively are design concepts Lotus and UrbanCONE. Lotus by Fulden Dehneli of Middle East Technical University in Turkey is an air purifier with three portable and rechargeable air cleaning balls. On the other hand, UrbanCONE, by Michał Pośpiech from Jan Matejko Academy of Fine Arts in Poland, is a device that can create healthy microclimates outdoors as it purifies an entire urban city. With almost 6,000 public votes, HERO, a gamified air purification concept design by Fiorella Rios of Turkey, won the People’s Choice Award. More than 1,700 concepts from over 60 countries around the world were submitted to this year’s competition. Among these is a concept designed by second year Industrial Design student Anna Klarissa Abjelina of University of the Philippines Diliman. The Hexis is a 2-in-1 kitchen appliance that features the ability to refrigerate and cook meals. This design made it among the Top 70 designs. The competition was conducted in five stages to allow students to focus and develop the different components of their designs throughout the duration of the competition: (1) submitting an idea and a sketch; (2) concept development; (3) visual development; (4) functionality development; and (5) the final event presentation. More than 100 concepts were chosen to develop their concepts further and be evaluated by Electrolux Design, Research & Development, and Marketing Innovation professionals. Each entry could be voted for by the public and the designs that received the most votes qualified for the next round. The six global finalists were: UrbanCone by Michał Pośpiech from Poland; Lotus by Fulden Dehneli from Turkey; Set To Mimic by Sorina Răsteanu from Romania; Future Hunter-Gatherer by Pan Wang from China / UK; Pete by Kovács Apor from Hungary; and Pure Towel by Leobardo Armenta from Mexico. The Electrolux Design Lab competition aims to engage design students around the world by inviting them to present breakthrough ideas for future households. Supporting Electrolux commitment to lead the evolution of home appliances, the competition fuels new ideas and inspiration for innovation, and offers an opportunity to reach the best emerging talent. The first winner received € 5,000 or approximately PHP 300,000 and a six-month paid internship in an Electrolux global design center. Second and third placers, as well as the People’s Choice winner also received cash prizes from Electrolux. To know more about the competition and this year’s winners, visit www.electroluxdesignlab.com.